Exercise Can Be Sweet Again... Try our Knee Donuts! 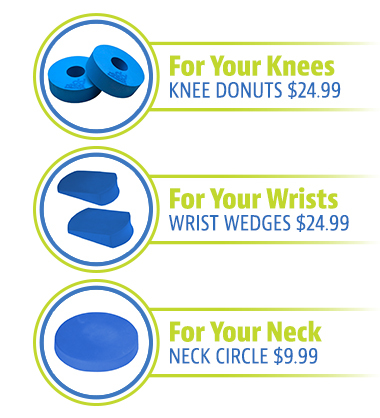 Our Knee Donuts can prevent, reduce, or eliminate knee discomfort during exercise or anytime your knees are on the ground. The secret lies in the Knee Donuts unique design... Your kneecaps are supported and NEVER touch the ground. 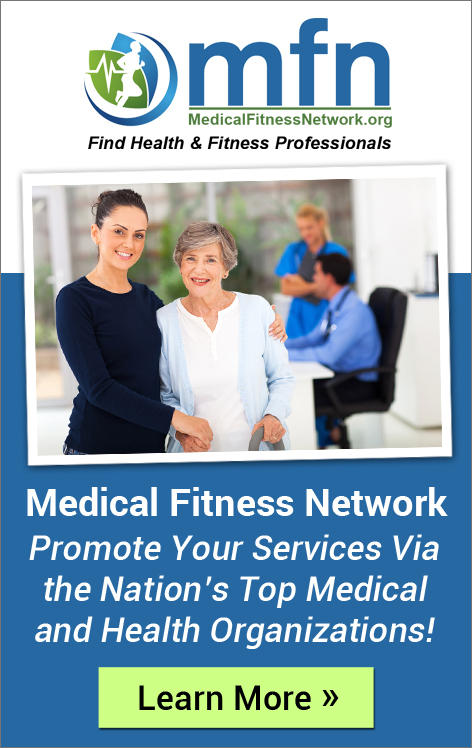 Use while working out, in fitness classes, yoga, Pilates, physical therapy, gardening, housework, and more. It's Time to Give Your Wrists a Rest! Our innovative design reduces stress on your wrists. 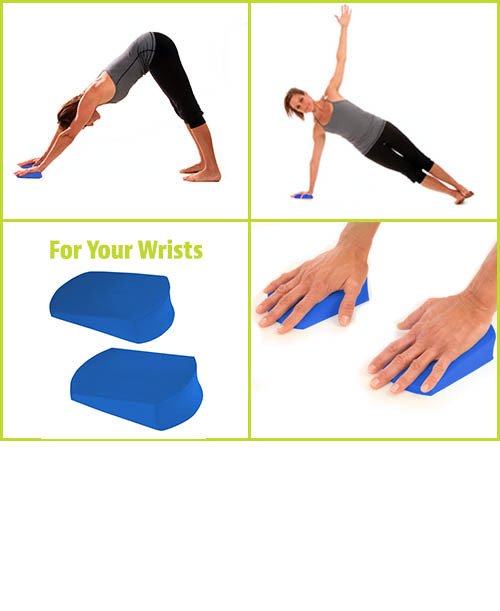 Use our Wrist Wedges in fitness classes, yoga, Pilates, physical therapy and during any weight bearing exercises. 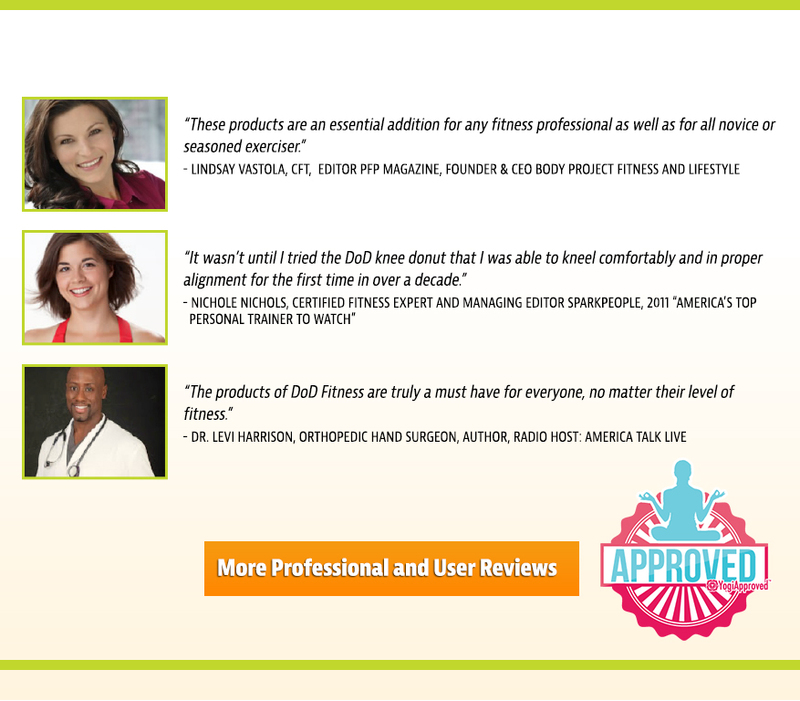 Fitness Pros agree: People with or without wrist problems will benefit by using our Wrist Wedges. Don't Let Exercise Be a Pain in the Neck! Our Neck Circle was designed to prevent, reduce, or eliminate neck discomfort while lying on the floor. Our Neck Circle supports your head and puts your neck in a biomechanically optimal neutral position. 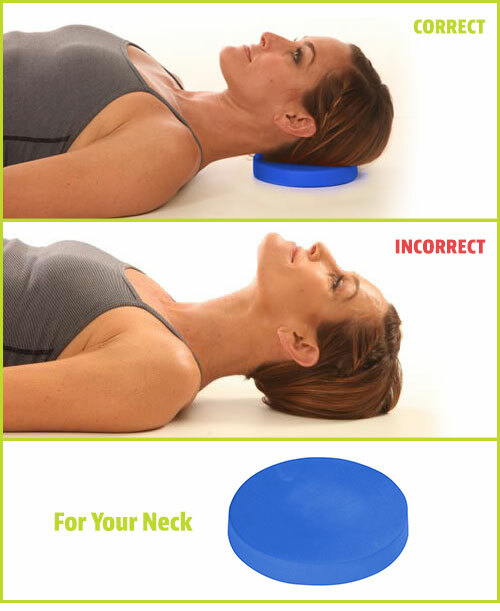 Use our Neck Circle in yoga, Pilates, while taking a break after hours sitting at your computer or anytime while supine. Your Knees, Wrists, and Neck will thank you! Buy all three; Special Price! 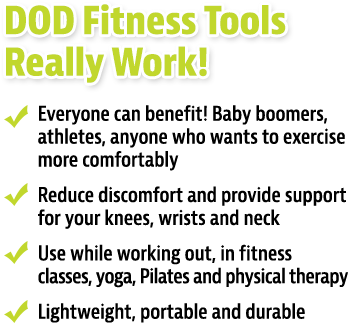 Order DOD Fitness products today and receive a discount shipping price on additional units! Sales Tax added to orders from California and North Carolina. A $9.00 Surcharge will be added to orders shipped to Canada, UK, Ireland, Australia, France, Germany, Switzerland, Finland, Sweden, Austria, Hong Kong, and Philippines.